← As it turns out, I like cycling too! 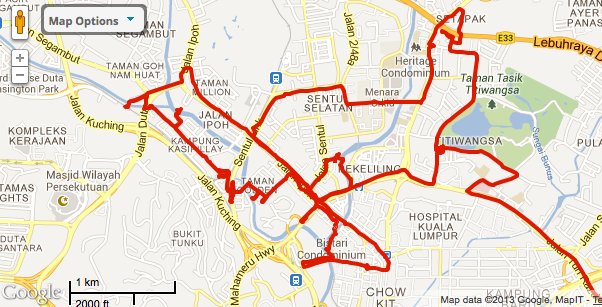 I joined another KL bike mapping survey this weekend. There were several people on folding bikes, some mountain bikes, a few tourers, and a road bike. The group of people are just as diverse and really nice. As usual, we were led by Jeff Lim. The route followed some busy roads but we also found, as usual, some really interesting back roads, lovely houses and even some wildlife! We look for all sorts of routes! This old guy had a net attached to his rod and let it drift. Didn’t see him get any fish. Another new development in KL. There was a huge otter in the middle of the city! This entry was posted in Cycling and tagged bike, Kuala Lumpur, mapping, urban cycling. Bookmark the permalink.